Recently, I’ve submitted a SPFx Web Part sample showing how to build a dynamic search experience using Office UI fabric components and SharePoint search REST API. 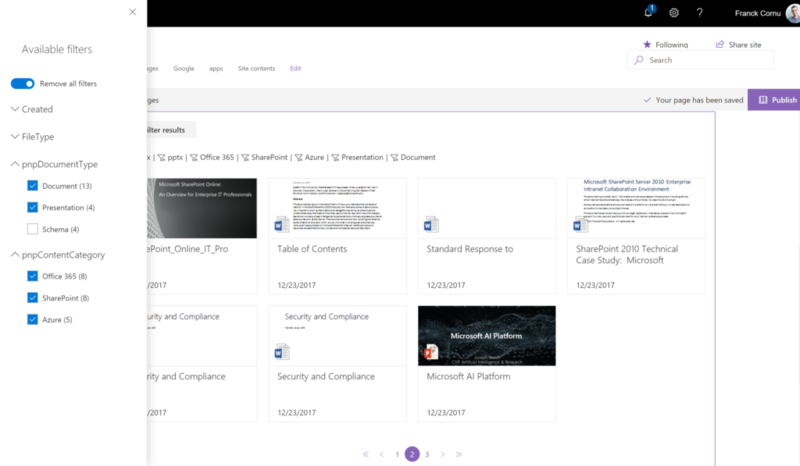 This sample comes directly from a real intranet project within SharePoint Online. Why you would you like to do this? It can be very frustrating, especially if you’ve built a nice information architecture you want to take advantage from via refiners. Also, you can’t even change the target result page for the global search box via search settings (it has no effect). The solution is for now to use either a classic search page with display templates (not for me anymore thanks) or build your own search experience with SPFx. To embrace the future ;), I chose the second option. However, in this post, I won’t talk about the integration of a search box in a custom header via SPFx extensions but I will focus on the search, paging and refinement experience with a static search query. The base search query in KQL format. The query template in KQL format. You can use search query variables. See this post to know which ones are allowed. The search managed properties to use as refiners. Make sure these are refinables. With SharePoint Online, you have to reuse the default ones to do so (RefinableStringXX etc.). The order is the same as they will appear in the refnement panel. Quite explicit. The paging behavior is done directly by the search API (See the SearchDataProvider.ts file), not by the code on post-render. Indicates whether or not the component should show the paging control at the bottom. From a personal point of view, I always use this pattern to make my code cleaner and more readable with one folder per component, one folder for data providers and one other for models (i.e business entities). To know more about this pattern, read this article or just study the react-todo-basic sample. Refiners (i.e search filters) are retrieved from the search results of the first page via the searchQueryRefiners property (set as query parameter). It means that when an user filters the results or switches the current page, refiners are not updated according the new search results, as the default behavior of SharePoint. It means results can be empty regarding the current filters combination. We use this strategy to always have a consequent filter behavior in the UI and avoid frustration for users. Panel to display refinement panel ;). Can be positioned on the left or right. GroupedList: An underestimated component that can be easily used to build collapsible sections. Checkbox to activate/deactivate refiners individually. Overlay, MessageBar and Spinner to handle errors/messages and waiting sequences. Button to build selected refiners. By this way, we make the pagination dynamic instead of doing it « post-render » by taking advantage of the API. Note: there is a bug prior to the 2.0.8 sp-pnp-js version regarding the page calculation. More info here: https://github.com/SharePoint/PnP-JS-Core/issues/535. Hope this sample will give you a starting point to build awesome search experiences with SPFx. See you soon for others cool SPFx components!